Western Province Governor Azath Salley listens to a group of SLIATE HND holders who met him at his office on Monday. Successful candidates from the Higher National Diploma (HND) in English course at the Sri Lanka Institute of Advance Technological Education (SLIATE) are eligible to apply for vacancies for graduate teachers in the Western Province. Western Province Governor Azath Salley said this at a meeting of a group of SLIATE students who met the governor at his office on Monday seeking eligibility for the graduate teachers’ vacancies advertised in the government gazette for which closing date of applications is April 18. The Higher National Diploma in English is conducted as full time and part time for two and half years and two years respectively. The full time course has two-year course work and six months implant training in specialised fields whereas the part time course has course work for two years. Former Assistant Director of Education A.B.M. Alavi has told the governor that the Province has a dearth of English teachers and teachers should be recruited soon. 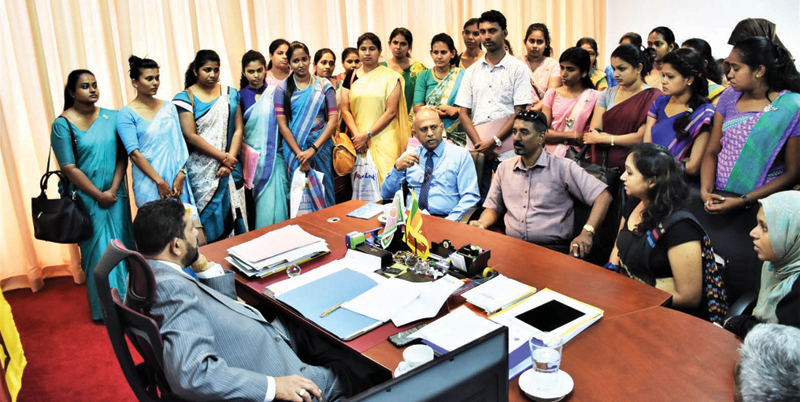 The SLIATE HND holders who met the governor has told that the SLIATE HND holders were given teaching appointments in the Uva, Sabaragamuwa, North Central and Eastern Provinces, but they are not considered for the vacancies in the Western Province. The governor has told them that only the residents of the province will be considered for the vacancies in the province and teacher vacancies will be filled soon.